Jack at Broomhall Community Centre reached out to us through a recommendation from one of our previous customers. He asked us to design, supply and install a new commercial kitchen space in place of the domestic kitchen they had previously. We were charged with mixing new equipment and appliances alongside refurbished equipment to deliver a high quality product whilst still saving money where applicable. We were also asked to supply and fit stainless steel cladding behind the 6 burner cooker and white, plastic cladding to the remainder of the kitchen. Once the builders and flooring contractors had done their part, we were left with a blank canvass to fill and 3 days to fill it. On day 1 we delivered all the equipment, including a brand new dishwasher from DC, new microwave from Sharp and new refrigeration units from Blizzard. We also supplied a refurbished Falcon Dominator 6 burner oven range. As quoted, we managed to use mainly refurbished fabrications, saving heavily against the price of new equivalent. We did not allow our cost saving to affect design however and therefore supplied a purpose built, bespoke double bowl sink unit with space under for the dishwasher to be housed as this was integral to the kitchen design. Our cladding team then set to work, firstly installing the stainless steel cladding behind the oven range, before tackling the white plastic cladding that would be used for the rest of the kitchen area. We decided, with the customer, for this cladding to be taken to half height, saving costs on materials and fitting whilst still providing a great splashback for all the kitchen surfaces. As the cladding was being fitted, our installation team worked with them, following them round where they had finished, installing the kitchen including extending/altering the water supplies and drains for the new sinks, fixing wall shelves, Before installing and commissioning all the equipment. All the cladding work was completed on day 1, as was the majority of the kitchen install, leaving the install team chance to come back in the next morning to finish off what they needed to before signing off the kitchen to the customer at lunchtime on day 2. A day and a half ahead of schedule. We were really happy with the finished project, bringing it in on time and below the centre’s initial budget. Giving them additional funds to spend elsewhere on the centre. Based in the heart of Sheffield, Blend Kitchen gave us the opportunity to design and build an open plan kitchen which would stand up to the rigours of a busy, city centre establishment but also have the flexibility to cope with Blend’s daily changing menu. We tackled this first by installing a neat extract system above the proposed cook line, utilising a refurbished canopy fitted in to an existing alcove, this not only looks great but also kept costs down. Before taking the ducting up and across the tall ceiling, all of which had to be finished to as high a standard as possible as all this work is on show to the public. Next, the wholly electric kitchen was delivered, including a large bain-marie hotcupboard with a stainless steel overhang that was placed over a low wall, creating an excellent pass and stopping the need for waiting staff to enter the kitchen. The kitchen also contained an electric range, fryer and grill, all designed to be placed in the alcove, gaining the kitchen some well needed extra space as well as being neatly under the hood of the extract. All the equipment, including the fabrications and some refrigeration that we also supplied, were from our refurbished stock, saving the customer a large proportion of cost of equivalent new equipment which was great for all concerned especially as this project is part of a community based charity! We also supplied some further equipment for a separate dishwash room, working around what existing equipment they already had to make the space work more efficiently. Our 4th kitchen for this returning customer, delivered in October 2017, we returned 4 months later to see how they were getting on! As you can see, we designed a simple layout utilising a cookline with refurbished Lincat appliances including gas chargrill, electric pasta boiler and fryer. We worked with the customer who purchased his own pizza oven. We also supplied the 2x large, double gastro, counter fridges both with overhead gantries. These have proved very popular with the staff as they not only have a massive capacity for storage, they also give a great surface for prep, especially for the homemade pizzas on the menu. Finally we kept in contact with the customer, supplying finishing pieces as they were asked for, such as wall shelving and undercounter refrigeration. Another project taken from concept to completion by ourselves. We had the brief to design and build a kitchen capable of servicing the nursery on site as well as several other sites whilst keeping costs under control. We took control over the design, supply and installation of this kitchen, including working with the client's electrician and plumber to ensure correct placement of services. Working with the client and the available budget, we chose a mixture of new equipment (including a rational combi oven) and selected, high quality refurbished equipment and fabrications. By working in this way we saved the client several thousand pounds without compromising quality or design. We also designed, installed and commisioned a bespoke ventilation system including fresh air input and gas interlock, during the installation we took measures to ensure the ducting went through pre-existing gaps in the flat roof where skylights had previously been, reducing the amount of work required by the client's contractors, saving on cost. As you can see by the very contrasting images here, we were involved in this project from the very start! No only were we involved in what went in the kitchen but what the actual kitchen space would look like. 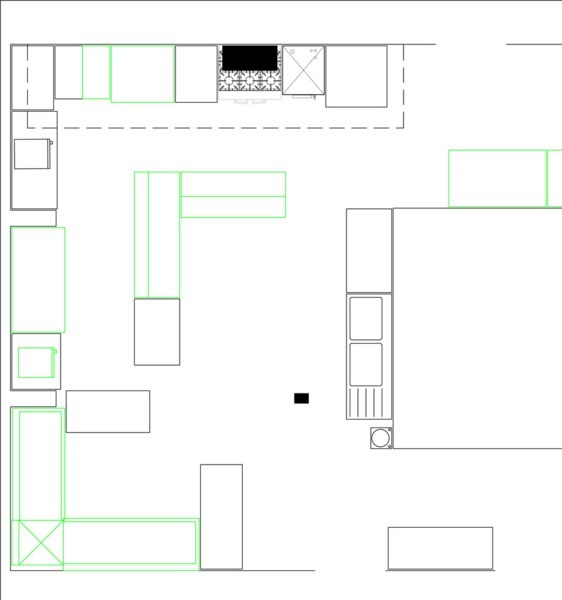 Once we had worked with the client and their contractors to decide on the final dimensions of the kitchen area, we got to work designing a compact, user friendly kitchen layout. We worked with the client's on-site electrician and plumber to ensure correct placement and sizing of services as well as offering advice on other aspects such as non-slip flooring. Utilising refurbished equipment and fabrications our design included an all electric cookline comprising of an electric range, griddle, grill and bain marie, prep area with heated gantry above, washing up/sink area with undercounter dishwasher and hot and cold servery/display section. We also took on supplying and fitting the ventilation system for the café, where again, we saved on upfront cost by supplying a refurbished canopy alongside bespoke ducting and new fan and controller. We also supplied and fitted the wall cladding, making use of both stainless steel cladding (behind the cookline) and white, plastic cladding on the other walls. Finally we delivered on the installation of the kitchen before handing the completed kitchen over to the client, this involved installation of sinks and dishwasher, including running of new fresh water connections and wastes, as well as the safe installation of the electric appliances. By utilising refurbished equipment and extract canopy on this particular project we managed to save the customer a large sum of money compared to buying new equipment whilst still delivering a quality service and attention to detail expected of a loal supplier.